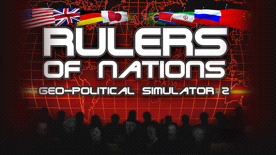 Rulers of Nations is a geopolitical simulator of the current world. Players play heads of state or governments (presidents, kings, prime ministers . . . ) of the countries that they choose at the beginning of the game. They can take initiatives in several areas—economic, social, military, domestic and foreign policy, environment, culture, etc. All the countries of the world are represented, with their variables and their own modes of functioning. The game includes phases for economic management, trade, wargame, construction, espionage, simulation, and political manipulation. 3D world map: It is used to make an inventory of a great number of points. Environmental and health engine: Coupled with the weather engine, it is able to simulate a great number of natural disasters. Countries and their variable characteristics: 230 countries or territories acknowledged by UNO are featured in the game, with approximately 170 playable nations. The personality base: With nearly 300 personalities for each country (50.000 for the world) and about twenty personal variables for each personality (age, political leaning, religion, popularity, charisma, loyalty to head of state, etc ...). The international organisations: More than 50 international organisations that play a role throughout the game, including: the UN organisations. Foundations for economic and scientific discoveries: Over 150 economic sectors are featured along with their production and consumption rules (costs, raw materials, transport costs, workforce qualification, productivity...). The historical base: With the main upcoming events: meetings of major organisations, scheduled elections for each country, dates of Olympic Games, religious holidays, etc.